It's versatility allows for seamless integration across our ThermAFrame® Centre Pocket and Flush Glazed Systems to achieve the most challenging structural and energy requirements. It has been designed to accommodate high performance double glazed units that can maximise the performance of the building envelope. ALUK's SC95TT Thermally Broken Sliding Door System is a superior, high performance sliding door solution with great aesthetics and design appeal. ALUK's SC95TT can be easily integrated into Alspec's Thermal Systems Range. A thermal break is an element of low thermal conductivity placed in an assembly to reduce the flow of thermal energy between conductive materials such as Aluminium. Thermal Breaks made of polyamide have been the chosen method of thermally breaking aluminum window products for more than thirty years in Europe, where the product originated. 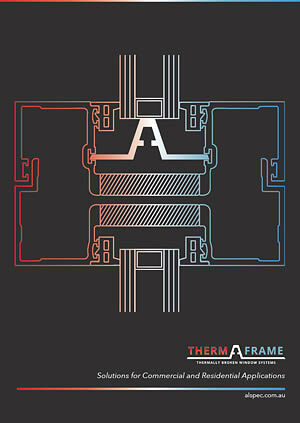 Alspec® uses only Technoform Polyamide Strips in our ThermAFrame. Technoform Thermal Breaks are made of fiberglass reinforced polyamide with glass fibers oriented in 3 directions for optimal structural performance. Structural performance and mechanical response are exceptional with the multidirectional glass fibres oriented in 3D to give improved load transfer.